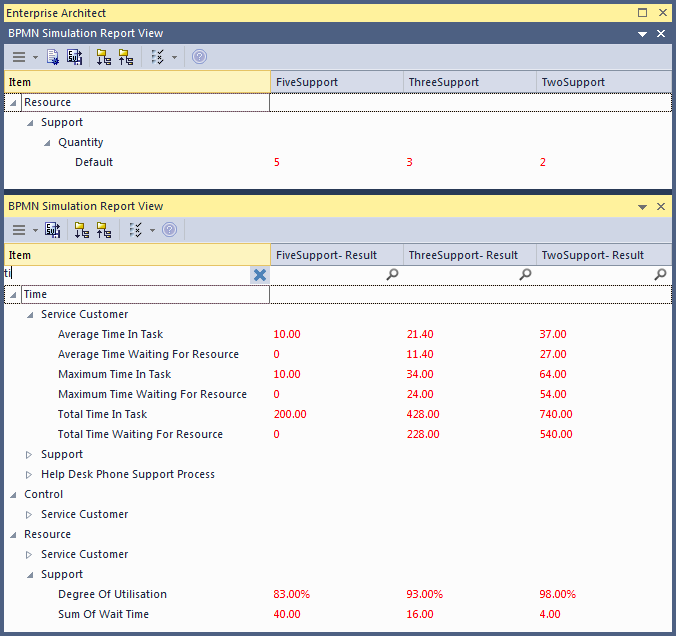 In this example, we create a very simple model to simulate a Help Desk phone support process. We set up a scenario in which resources are limited and the requests have to be put in a waiting queue for a resource. 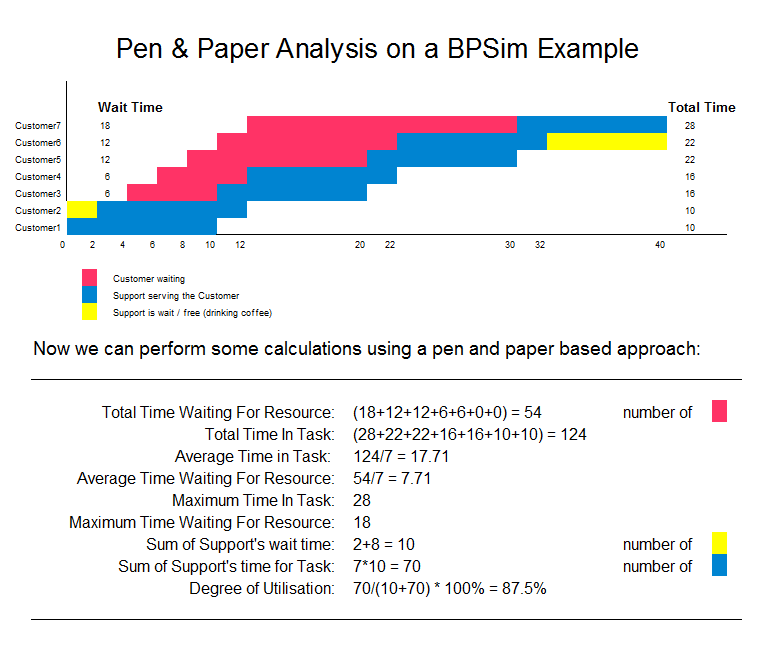 Then we try to seek a balance point between customer's waiting time and the number of resources, using a what-if analysis. 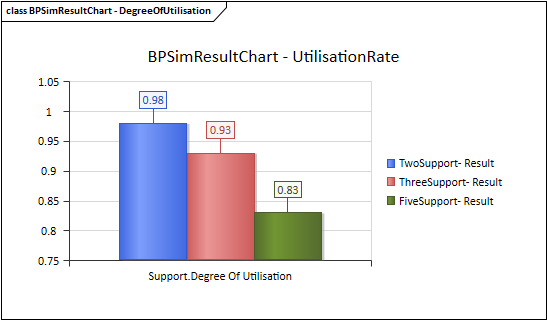 Firstly, we model this process step-by-step, starting with a simple parameter setting than can be calculated with pen and paper, then verifying it with EABPSim. After that, we perform a what-if analysis that might help the manager to make a decision. The model itself is very simple, consisting of a Start Event, a Task and an End Event. 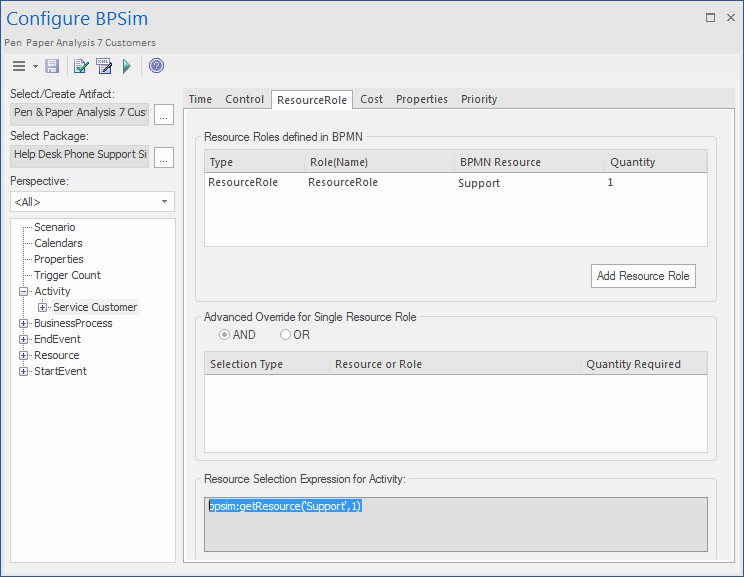 Create a BPMN2.0 Resource named Support; this element will be used in the BPSim Configuration. Seen from this result, it is already a very complicated computation for such a simple model when resource constraints are applied. When the process expands and more constraints are applied, analyzing the process with pen and paper will quickly become impossible. We will demonstrate how EABPSim can help. 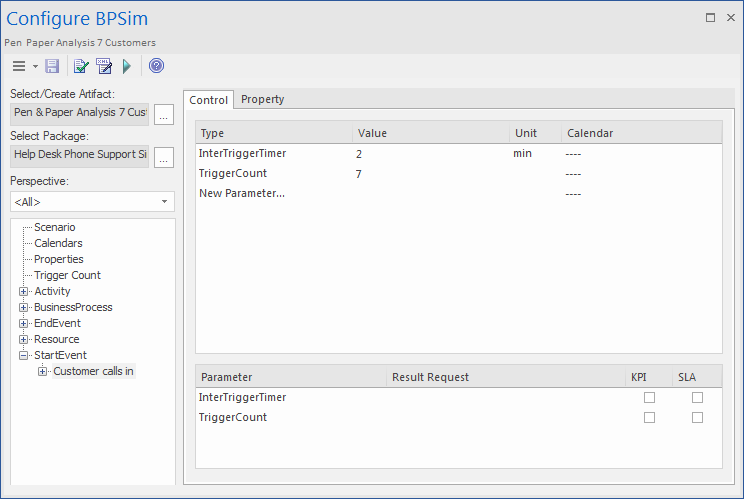 All the BPMN elements will be loaded in to the Configure BPSim window. In the 'Resource Selection Expression for Activity' panel the automatically generated expression bpsim:getResource('Support',1) displays. Tip: You can select the 'Show Only Non-Empty Items' option to filter the results. The results match the pen and paper analysis. 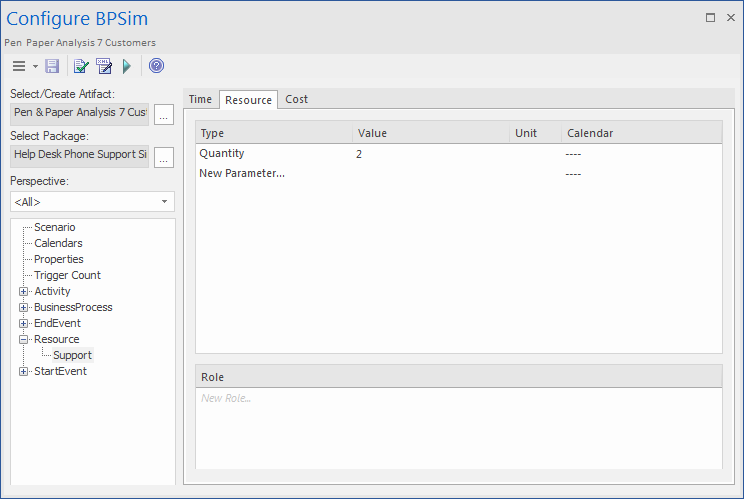 You can create a new Business Process Simulation Artifact by copying an existing BPSim Configuration. Copy the Pen & Paper Analysis 7 customers element and press Ctrl+Shift+V to paste, giving the new element the name TwoSupport. The docked comparison views show the configuration differences and the corresponding result differences. The customers will most likely be satisfied with 5 Support resources; however, the cost might be out of budget. So 3 or possibly 4 Support resources might be a balance point for this case. 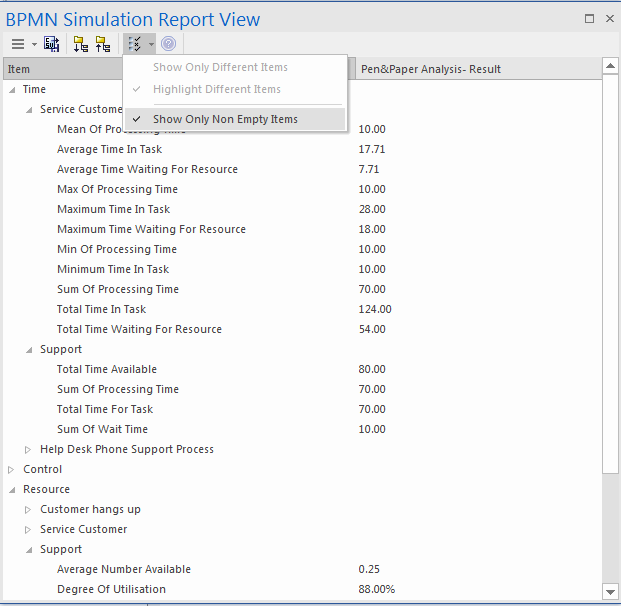 You are recommended to copy one of the Business Process Simulation Artifacts and configure and run a simulation for 4 Support resources.